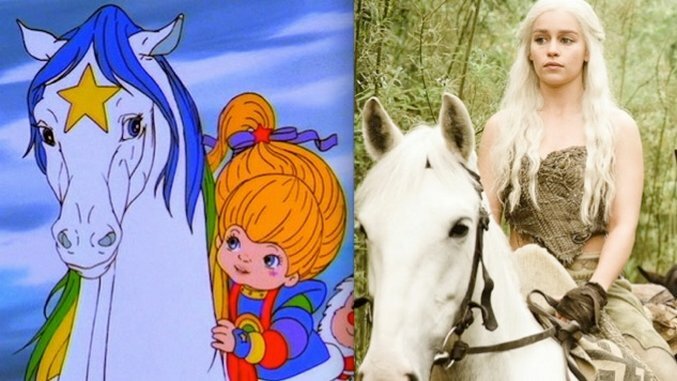 It’s been said that opposites attract, and perhaps that is why this Game of Thrones and Rainbow Brite mashup works so divinely. Rainbow Brite is a peppy, super ‘80s, bright and shiny animated show about a little girl named Rainbow Brite. But, if one looks a little deeper, she does bear some similarities to Khaleesi from Game of Thrones. They’re both leaders and do-gooders who have magical powers, which they hope to use to make a dark world a brighter place. This awesome mashup come from the mind of artist Revenge Dioramas, who promotes female empowerment through humorous commentary. After checking out this hilarious gallery, you can support more of her work here.